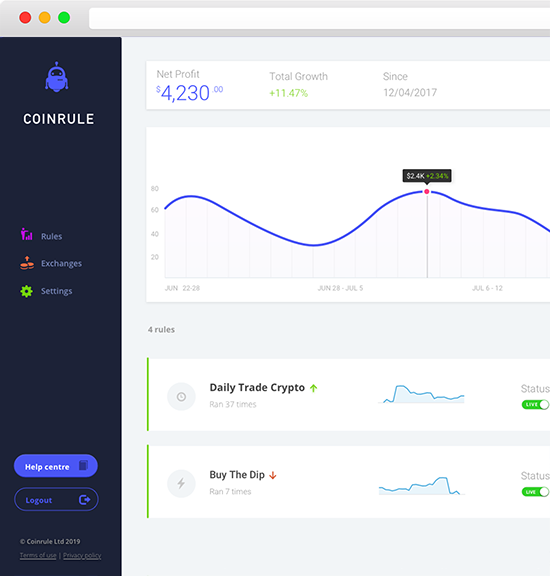 Coinrule is a platform to send automated trading instructions to your favourite cryptocurrency exchanges. No coding required. Set custom automated trades and never miss a rally or get caught in a dip. Coinrule obsessively seeks out effective market indicators to enable smart allocation of funds while putting you in control of your trading machine. Coinrule is a beginner-friendly and safe platform to send automated trading instructions to your favourite exchanges. We never ask for private keys or exchange withdrawal rights. Each rule can be set to run as fast as every minute and executes within seconds. New indicators are added every week and announced on our blog. Receive free trading signals, create rules and manage your portfolio for 30 days for free.